H.E. President Dr. George Manneh Weah today, January 24, 2019 received Letters of Credence from ambassadors representing six countries from three continents—Africa, Europe and Asia. It is the first time the Liberian leader received such a huge number of ambassadors in a single day since his ascendency a year ago. The ambassadors included Shani Cooper of the State of Israel, Margita Fuchcova of Czech Republic, Nelson Ocheger of the Republic of Uganda, and Gunnar Andreas Holm of the Kingdom of Norway. Others were Ambassadors Mahamadou Zongo of the Republic of Burkina Faso and Ricardo Lopez-Arana Jagu of the Kingdom of Spain. 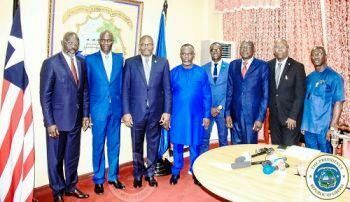 Receiving the ambassadors at intervals at his Ministry of Foreign Affairs Office, President Weah welcomed them and expressed gratitude to their respective governments for preferring them to represent their countries in Liberia. While welcoming the Ambassador Extraordinary/Plenipotentiary of the State of Israel, Shani Cooper, the President accentuated the importance of sustaining the longstanding ties between the two countries. He said Liberia’s relations with Israel had lost strength for years and expressed the hope that ties between the two countries will grow in the coming years. He said he was hopeful that the presence of the new Israeli envoy would help embolden Liberia-Israel ties to pick up greater strength and reach new heights under his administration. In remarks, Ambassador Cooper said she was delighted to be in Liberia and thanked President Weah for the warmth reception accorded her and delegation. Describing the relationship subsisting between Liberia and Israel as precious, she conveyed warmth sentiments on behalf of the Government and people of Israel. She pledged to work effectively toward strengthening her country’s ties with Liberia, and revealed that lots of Israeli companies were interested in investing in Liberia, mainly in the agriculture, security and other sectors to boost the Liberian investment climate. Ambassador Cooper, who praised President Weah and his administration for carving the Pro-Poor Agenda for Prosperity and Development (PAPD), expressed the hope that Israel would closely work with Liberia to ensure that Liberians get full benefits of the PAPD. Also presenting her Letter of Credence, the Ambassador of Czech Republic, Margita Fuchova, said she was honored to be in Liberia and to take up assignment on behalf of her government and people. “First of all, let me congratulate you, Mr. President, on your ascendency to the Liberian presidency,” she said, fondly recalling the cordiality of the diplomatic ties between the two countries. The Czech envoy said she was hopeful of a deeper and dynamic relationship between the two countries in the coming years. She hailed Liberia for choosing the path of peace and prosperity, which she said the Czech Republic was ready to support. She also spoke of her country’s readiness to strengthen the economic relations between Liberia and Czech Republic, mainly in the areas of trade and investment. “Czech investors are ready and willing to contribute to improving the living standards of Liberians through investment in energy, agriculture, mining, education and healthcare,” she said. For his part, the Ambassador Extraordinary/Plenipotentiary of the Republic of Uganda, Nelson Ocheger, conveyed best wishes to the Liberian leader and people of Liberia from President Yoweri Museveni, stating that he was overwhelmed by the warmth reception and opportunity granted him by the President. The Ambassador took specific note of the longtime cordial bilateral relations between Liberia and Uganda. He pledged to work to consolidate ties between the two countries. The Ugandan envoy said he would use his stay in Liberia to focus on political and diplomatic relations and other areas of mutual interest to the two countries for the benefit of their peoples. He noted the governments and peoples of the two countries have not seen much of the benefit of the relations, apart from technical experiences. Ambassador Ocheger said there are several areas of mutual interest that can be explored in the coming years to make Liberia-Uganda relations stronger and beneficial. These, he said, included the areas of mining, education and health, energy and infrastructure. He recalled the signing of African Free Trade which he said presented an opportunity to the two countries to begin investing in infrastructure, water and rail transport to facilitate the movement between the two countries and the continent at large. “Given the challenges we face, it is time for us to begin to focus on trading. It is time for us to begin trading as a region so that we can fit in the regional and international trading order,” he said. He said it was important for the two countries to work together to skill their youthful populations, proposing the establishment of a corporation framework through which the two governments can work to achieve this goal. Responding, President Weah welcomed and congratulated Ambassador Ocheger for his preferment to represent his country in Liberia. The President disclosed that he was not surprised that the Ugandan Ambassador was in Liberia weeks after he and President Yoweri Museveni had met in China and discussed ways to strengthen their Liberia-Uganda relations. President Weah indicated it was imperative that Liberia, which is Africa’s oldest independent republic, work with other countries to promote regional peace and integration in order to strength African corporation. Also presenting his letter of Credence, Norway Ambassador Gunnar Andreas Holm reflected on the existing ties between the two countries and noted how Norway has been engaged with Liberia, contributing to the electricity sector. The Norway diplomat recalled fond memories of President Weah’s address to the United Nations General Assembly (UNGA) and his call for global fusion against climate change. He said Norway and Liberia share similar positions on other critical global issues and called for the need to work harder to achieve those goals. President Weah thanked him and expressed his government’s determination to work with the Kingdom for the benefits of their people. Also, Ambassadors Mahamadou Zongo and Ricardo Lopez-Arana Jagu of Burkina Faso and Spain respectively, expressed delight for representing their corresponding countries. They promised to work toward expanding and consolidating the ties between their countries and Liberia. On behalf of the government and people of Liberia, President Weah welcomed them and spoke highly of the ties among the countries and how they could achieve through greater collaboration.